LATISSE® is the first and only FDA-approved prescription treatment for inadequate or not enough eyelashes. Latisse helps them grow longer, fuller and darker. LATISSE® solution is a once-a-day treatment you apply topically to the base of your upper eyelashes, as instructed by your doctor. Then, gradually, the results come in. You may start to see more length in as little as 4 weeks with Latisse and you should achieve full growth in 16 weeks. It’s not an illusion of growth. It’s your own eyelashes – only better. While Latisse and Lumigan is the same product, there are important differences in how they are used. It must be noted that upon discontinuation of treatment, eyelash growth is expected to return to its pre-treatment level. 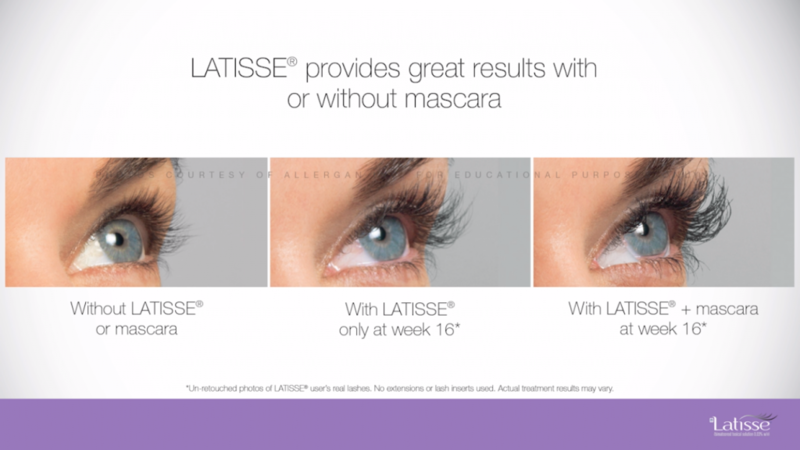 Latisse is now the only prescription eyelash product approved in Canada to naturally grow longer eyelashes. Today, popularity has since grown worldwide and it is said that 1 Latisse kit is sold every 30 seconds. Just like the hair follicles on the rest of your body, your eyelashes work the same way; they develop and grow for a period of time before eventually falling out. How Latisse works, is that it prolongs the growth phase and increases the quantity of hairs that sprout from your eyelashes. Consistently using the Latisse method will get you the best results typically after 12 to 16 weeks of daily use. Latisse achieves its goal by applying it on the upper lash line each night, with the drug spreading to your lower lash line automatically as you blink and close your eyes. It’s important that you never apply Latisse in your eye or onto your lower eyelid, as that might cause some prolonged discomfort. It would also be prudent for your face to be clean before applying the product and for your makeup and contact lenses removed — the fewer things in the way of the Latisse solution, the better. It is always recommended to discard each applicator after one use to avoid eye-infections. At the end of the day, this is a simple and easy process that can be done daily by yourself and will bring you amazing results and therefore make you feel beautiful. What are you waiting for?